There’s something really special about buying fresh herbs and vegetables – they look so appealing and smell so delicious. Up until World War II, vegetables were grown and sold locally so they were always fresh and tasty. There was a high chance that the vegetables you ate at the dinner table had been growing the very same day. We sometimes forget in this mechanised age what it is like to grow our own vegetables. Not far from Botany Bay in Sydney, the La Perouse Market Gardens have operated since the 1830s. The oldest market gardens in the country, they are listed on the State Heritage Register, particularly for their heritage value to Sydney’s Chinese community. Initially they were worked by European settlers but after the gold rushes of the 1850s, many Chinese migrants took the opportunity to grow and sell their own produce there. Ricky Tang, one of the present-day market gardeners, assures Jerry that their produce is still all sold on the same day that it is harvested. Set on ancient coastal duneland, the original soil is pure sand. Over the years the market gardeners have incorporated their own composted vegetables and lots of poultry manure so now the soil is rich and breaks up just like crumbly chocolate cake. Traditional methods are used to work the ground and provide drainage. Because these gardens are in a drainage gully there is a large volume of ground water moving through, following a system of drainage channels. The hand-excavated soil is used to create swales, ideal for cropping sweet potato and bitter cucumber. 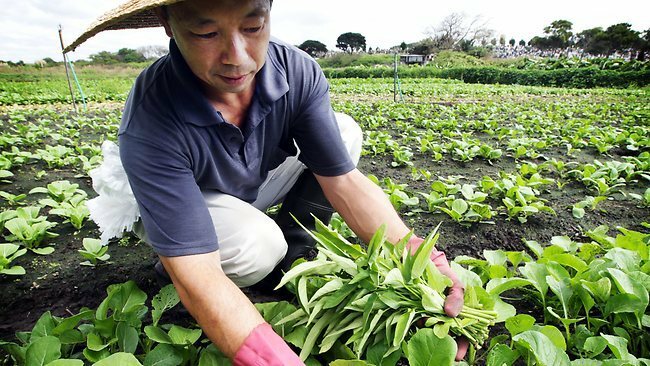 The channel sides are protected from erosion by planting taro and the gullies yield watercress. Terracotta pipes are laid end to end along a natural drainage channel. Water will enter the pipes through the seams and accelerate drainage away from the garden beds. The only rule when using these pipes is to ensure that they are laid below the depth of cultivation. Market gardening requires effort and attention. In the early days, everything was tended by hand all year round, so it was necessary to live and work on the site. This traditional connection between home and garden lasted until about 50 years ago when irrigation gave people free time. The old accommodation buildings are now used by employees for rest breaks and meal breaks. La Perouse Market Gardens provide proof that high-quality vegetables can be grown commercially without losing the human scale. We must keep these gardens at all cost. Chaning oneself to a lettuce leaf might be hard but now impossible.